Living through a traumatic event is an unfortunate reality for many people with each episode resulting in varying recovery timelines and potentially long-term effects. When lasting effects result in daily challenges to normal activities, a diagnosis of post-traumatic stress disorder (PTSD) can trigger a treatment protocol of medications, counseling and support to help manage ongoing avoidance and arousal symptoms, and the cognitive decline that can often occur simultaneously. Numerous events can cause PTSD, such as personal assaults, serious accidents and weather disasters, affecting both men and women, but research studies have primarily focused on male veterans and the armed conflicts that they endured. While much has been learned from this focus, there is a need to understand the longitudinal cognitive effects of PTSD on women. 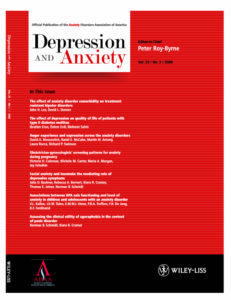 In research published this month in Depression and Anxiety, a large cohort of female nurses participating in the Nurses’ Health Study II were invited to complete a self-administered, online version of the Cogstate Brief Battery, a computerized cognitive test battery, to assess their psychomotor, attention, visual learning and working memory abilities. This group of 14,151 women (mean age of 60.3) had reported a history of trauma exposure and PTSD on a 2008 supplemental questionnaire and were willing to participate in follow-up testing. Included in that questionnaire was the Center for Epidemiologic Studies Depression (CES-D) scale to assess depression. Exposure to trauma was measured with the Brief Trauma Questionnaire, which includes 15 listed events, with respondents indicating their first and most distressing event, if more than one. To assess their PTSD symptoms, the Short Screening Scale for DSM-IV PTSD was used to classify the women into four groups; no trauma experience, trauma exposed but no PTSD symptoms, trauma exposed with one to three symptoms, and trauma exposed with four to seven symptoms. Next, each woman was given online access to the Cogstate Brief Battery, consisting of four computerized tests; Detection (psychomotor), Identification (attention), One Card Learning (visual learning) and One Back (working memory). The Cogstate Brief Battery has been shown to have high criterion and construct validity showing subtle, early signs of cognitive decline in both supervised and unsupervised settings. Previous research has shown that combining the tests into composites show high test-retest reliability and clinical utility, so Detection and Identification was combined as was One Card Learning and One Back. The results showed that compared to the “no trauma” group, those women with elevated PTSD symptoms performed significantly worse on both composite cognitive indexes. The group that had experienced trauma but with no PTSD symptoms also performed significantly worse on the learning/memory composite, although with a smaller effect size. The association with cognitive decline on the Cogstate Brief Battery was strongest when factoring in both elevated PTSD and depression symptoms. “To our knowledge, this is the first study to demonstrate that elevated lifetime PTSD symptoms are associated with worse cognitive function in a large civilian sample of middle-aged women,” wrote the researchers.